Today marks Earth Day and we thought it would be an appropriate time to give you a season update. The team at Florida Leatherbacks Inc. has been so excited for such a great year. We feel very lucky to be doing the work we’re doing and we love to share it with you. We will continue to provide photos and updates and please feel free to ask us any questions you have. We have a lot of people asking where we conduct our work. We work on a small, somewhat private beach in southeast Florida. We don’t disclose the exact location of our encounters for the safety and well-being of the turtles. We’re often asked if red lights are allowed on the beach and we have to remind everyone that no light is allowed on the beach without a Marine Turtle Permit from FWC. Red light, while less harmful than white, is still distracting to nesting turtles and our team takes caution when working around a turtle’s face or head in an attempt to be as respectful as possible. We conduct our work and take photos using the natural light provided whenever possible. The work that we do is conducted in just a few minutes with a small, red headlamp. We make sure that we’re not interfering with the nesting process as we quickly do our workup and then allow the turtle to nest in peace. We know people wouldn’t like having a light shoved in their face during the labor process so we treat our turtles with the same respect. We feel very fortunate to have some talented photographers on our team that can document our work using natural light and long exposures with no effect on the nesting turtle. First update – we encountered Rosa tonight for the 6th time this season! Six nests and still going strong. If she keeps going, she’ll break our record for the most nests in one season (nine). Rosa is a pretty special turtle. Often times, we encounter turtles just once or twice a season because they are nesting throughout south Florida on beaches outside of our study area. But Ms. Rosa has consistently nested on one small stretch of beach since she was tagged on February 28th. We also encountered Wildfire this week. Wildfire is a very special turtle to our group. She was tagged in 2014 and also nested in 2016. Earlier this week our team encountered a total of TWELVE leatherbacks in one night. It was a busy but fun night! Four of the turtles were new, one was tagged previously this year on a different beach, and the remaining seven were tagged in previous seasons. They were tagged in 2015, 2014, 2013, 2011, 2008, and 2002. Our favorite recapture of the night was Spica. Spica was tagged way back in 2002 and has been one of the most frequently seen leatherbacks. We’ve had quite a few turtles this year that were tagged many years ago. Just a few of the highlights are Spica (2002), Pyxis (2003), Electra (2002), Musca (2003), Mola (2003), Rainy (2004), and Bunny the Easter turtle (2004)! These girls and 57 other individuals have paid us a visit already this year! We’ve had 14 new turtles and 50 recaptures so far this year. Some of our interesting recaptures include Fran, a turtle originally tagged in the Archie Carr National Wildlife in Melbourne in 2011. We also encountered Valkyrie, a turtle that was tagged on Blackbeard Island, Georgia in 2010. Earlier this week we encountered Sally. Sally is unique because our team encountered her seven times just last year. Leatherbacks typically nest every 2-4 years but every once in a while they’ll nest in consecutive years and Sally happens to be one of those turtles. This encounter was her second encounter by our team this year. We’re often asked why we name our turtles. The names don’t provide scientific value but they certainly mean something to our volunteers. Our team loves to get an alert when a turtle is encountered and it’s one that they remember. Names also help us remember individual’s histories and keep track of turtles over the years. We would love to hear your name suggestions if you have them! We’ve had a total of 90 encounters with 64 individuals so far. Two of the turtles we saw tonight were recaptures from previous seasons that we had not yet seen this year. It continues to stay interesting our there! 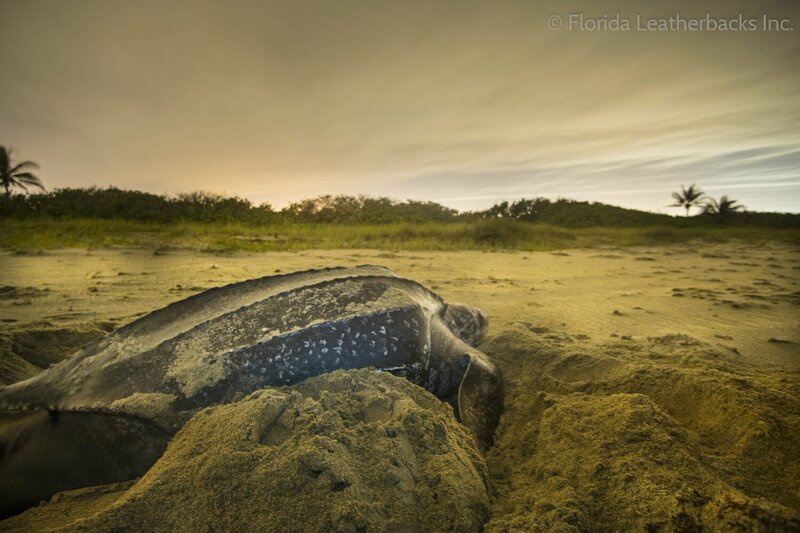 Leatherbacks nest every 9-11 days and can lay as many as 9 nests in a season (maybe more!) so we’ll continue to see our girls in the coming weeks. We’ll keep you updated but make sure to check out our Facebook, Instagram, and Twitter accounts for regular updates.